Various Artists. Cosmologies. Installation view. W Wall, Main Gallery. 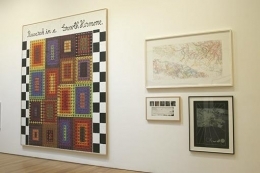 James Cohan Gallery, New York. 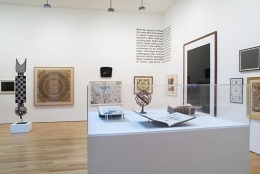 James Cohan Gallery is pleased to present Cosmologies, an exhibition which explores the wide ranging strategies used to depict notions of "the universal." The show juxtaposes works from as early as 10th century Mimbres pottery to Vija Celmins' 1996 meticulous graphite rendering of the night sky, from 17th century illustrated texts by European Hermetic philosophers to 17th century Indian Jain cosmologies, as well as a newly commissioned installation by assume vivid astro focus. The exhibition will be a visual montage of the many approaches to giving shape and order to a world view. The inherent link between humans and the universe is described in Robert Fludd's seminal illustrations and text published in 1617 (Macrocosmi Historia). Fludd, an English physician, Mystic and pantheistic theosophist, was a critical thinker for the Hermetic philosophers whose axiom was as above, so below. One of Fludd's theories links the blood flow of man directly to the rotation of the planets. Anselm Kiefer, the German painter, long preoccupied with the relationship between heaven and earth, has cited Fludd in many works. Kiefer's large scale lead book The Secret Life of Plants, 2002, depicts the night sky with astronomic numbers used by scientists to identify the birth place and death of a star. From page to page the stars morph into poppies, the flower of forgetfulness. Kiefer seems to be questioning the notion that science could quantify the universe in all of its magnitude. 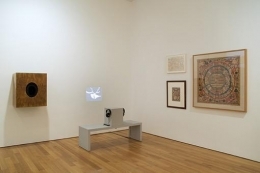 Similarly, Cerith Wyn Evans' text questions the role of science by highlighting a seemingly minor detail resulting in major consequences – small specks of microscopic dust mistakenly recorded as whole star systems. Another means of visualizing the cosmos is to diagrammatically map belief systems as they relate to one's existence. Tibetan mandalas are isometric plans of spiritual places describing an architecture of light and space as a vehicle for meditation. While Jain cosmologies take a mandala-like form, the circular motifs which they employ are visualizations of ancient texts on Hindu deities and their place within the cosmos – heaven, hell, or earth. Using the mandala structure to a very different end, Ad Reinhardt's Portend of a Yhung Mandala, 1955, has created a humorous systemic ordering of "The Art World" where iconic art historical imagery such as the Egyptian goddess Isis and Greek mythological figures co-exist with earthly creatures, each assigned their own artistic role such as "Artist as Art-Director Holy-Monkey-Wrench" and "Artist as Doodle-Kaboodle Scumble-Bumpkin." Seen in a more contemporary context, artists such as Ward Shelley, Dominic McGill, and Mark Lombardi incorporate text in a diagrammatic fashion to explore personal notions of the world. McGill's In the Shadow of that Hideous Strength, 2006, shows a central tree-of-life radiating light and swirls of political and cultural text from the base of the trunk. Lombardi illustrates political conspiracy theories as if they are a star system or family tree in Inner Sanctum; The Pope and His Bankers Michele Sindoma and Roberto Calvi, ca. 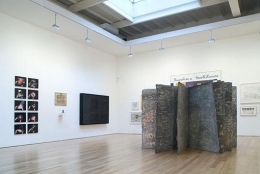 1959-82, 1996, while Shelley focuses on cultural figures such as Carolee Schneeman to reference connections between the participants and events of world history. 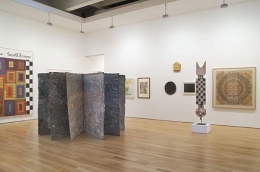 Throughout the exhibition, a checkerboard motif appears on a variety of objects, among them the Mimbres pottery, the Burkina Fasan ceremonial masks, as well as Alfred Jensen's monumental paintings. These contrasts of light and dark are representative of celestial observations – the Mimbres pot specifically citing the Milky Way galaxy, while Jensen pays tribute to ancient forms of systemizing the universe. His paintings include depictions of Central American temple plans that were based on the rotation of the sun and planets, which also determined their calendrical system. Cosmologies aims to describe a lineage of thought which has passed through many cultures: an innate human desire to define a place in the universe. Whether it is through religious means, philosophical thought or personal expression, the instinct to create order from chaos is a commonality throughout time and history. This exhibition was a curatorial collaboration by James Cohan, Elyse Goldberg, Arthur Solway, Jessica Lin Cox and Ginger Cofield. Participating Artists: Allora & Calzadilla, Kamrooz Aram, assume vivid astro focus, Ingrid Calame, Dawn Clements, Joseph Cornell, Simon Evans, Cerith Wyn Evans, Nancy Holt, Alfred Jensen, Jess, Jasper Johns, Laleh Khorramian, Anselm Kiefer, Kimsooja, Yayoi Kusama, Mark Lombardi, Josiah McElheny, Dominic McGill, Matt Mullican, Ad Reinhardt, Matthew Ritchie, Thomas Ruff, Ward Shelley, Shahzia Sikander, Robert Smithson, Fred Tomaselli, Sara VanDerBeek, Martin Wilner, Terry Winters, Adolf Wolfli.